On debut, Harlow (2 f Proisir – Joan’s Girl, by Pyrus) staged a last to first effort in winning the $30,000 2YO 1200 metres, sponsored by Te Akau Racing – Three Times Karaka Million Winner, on Legends’ Day at Te Rapa. Consistent at the trials with two thirds and a second, Harlow was steadied to last off the outside gate by Matt Cameron, stood the leader eight lengths at the 600m and was still last nearing the 200m before kicking into overdrive and winning going away with her ears pricked. Running the 1200 metres in 1:11.9, last 600m in 34.9, Harlow returned $6.60 & $2.80 on the NZ TAB tote, becoming the seventh individual two-year-old winner this season for trainer Jamie Richards. “She’s got a bit of presence about her the white-flecky mane and tail makes her stand out,” Richards said. “And, I think the stock of Proisir look quite exciting. “We really like her. She trialled well and it was always going to be tricky from back in the field, but she showed her class and Matt (Cameron) gave her a lovely ride. 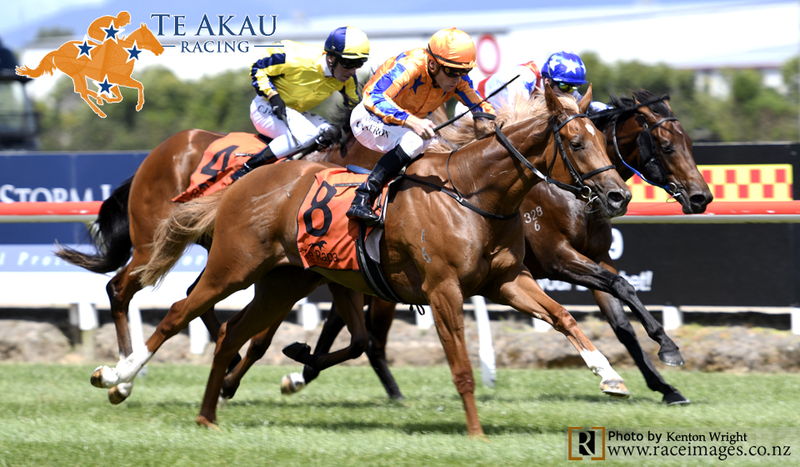 A race Te Akau has won six times, the $100,000 Matamata Breeders’ Stakes (Gr. 2, 1200m) is contested on Saturday 23 February at Matamata. Harlow was purchased as a yearling by David Ellis at the 2018 New Zealand Bloodstock South Island Sale, from the draft of Pear Tree Farm, owned by the Te Akau Blonde Bombshell Syndicate (Mgr: Karyn Fenton-Ellis MNZM). On hand to celebrate the victory were part owners Carol Doyle and Warren Devereux. Devereux, who travelled from Wellington for the race, said: “When Te Akau was advertising shares, the thing that struck me was that she had a real likeness to Choisir (grand-sire: Australian Champion Two-Year-Old and history making racehorse). “I hadn’t had a share in a horse for years. We had a horse in the 70’s called Decor Doll, out of an unraced Mainbrace mare, and she won six races. Te Akau principal David Ellis said: “We’d sold everything from Karaka that year so we decided to look to the South Island Sale. Choisir is a very good sire. And we’ve got some nice horses by his son, Proisir. As race sponsor, Ellis said: “It’s an honour to be invited to sponsor at this great Club, and we’ve won this race a few times with horses that have gone on. I’m thrilled for the owners and team that look after this filly and she’s got a bright future looking at the last 200 metres of the race. It’s great to have some of the owners here experiencing the thrill. Harlow was strapped by Teina Walters. “Teina is a young man that’s doing a sensational job at Te Akau Racing. He’s has a great affinity with the horses and someone that I’m really proud to have in the team,” Ellis said.